Identification: Hindwing with 1 short tail. Upperside of male light reddish-brown; female with yellowish tinge. Underside of hindwing with dark crescents near outer margin. Spot near tail is dull orange with a black center. Life history: Males perch on top of trees and sometimes patrol for females. Eggs are laid singly on stems and hibernate until spring. Caterpillars feed on tender young leaves. Caterpillar hosts: Several species of oak (Quercus). Adult food: Flower nectar including milkweeds. Habitat: Oak hillsides and chaparral. Range: California west of the Sierra Nevada, Transverse Range, and deserts, from Mendocino County south to San Diego County and into Baja California Norte. 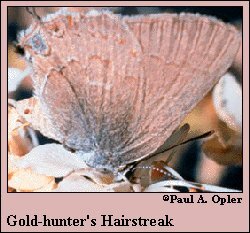 Conservation: The Santa Monica Mountains Hairstreak (subspecies fumosum) is highly localized and threatened by urbanization in southern California. Management needs: Protect habitat of remaining colonies of subspecies fumosum. California. 148 pages, 10 color plates. World Conservation Union, Gland, Switzerland.